I skipped the plenary session to put some finishing touches to my presentations – and was also late for the first presentation I had selected for today (Corinne’s and Eve’s session on how to work successfully with a translation partner). Nina had arrived before me, and told me the session had been very good and well presented. Nina than stayed for a second presentation on a similar subject (cooperation between translators in virtual workgroups), this time by Friederike Butler and Jeana Clark – again, a very informative session. The second session I attended was Overview of Editing Basics for the Translation Professions, by Literary Division’s Distinguished Speaker Greer Lleud. Lleud has many years of professional experience in the publishing in various capacities, and provided clear explanations of the various types of editing professionals and what they do: what distinguishes line editing, for example, from copy editing. 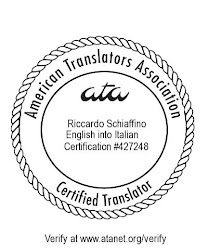 Although the content mostly concerned editing in the publishing world, it was also useful for translators and translation editors. In the afternoon I went to two Italian session: Translating Style, by Tim Parks, and Class Action (Italian Style), by Barbara Arrighetti. Both very interesting presentations – in particular Parks’, as he provided several examples of good (and bad) work from English into Italian and from Italian into English, from translations of Henry Green, F. Scott Fitzgerald, Elsa Morante and Niccolò Ammaniti, proving how style in translation may get all the more difficult precisely in apparently simple passages. Barbara Arrighetti presentation on the differences between common law class actions and recently introduced apparently similar actions under civil law was technical, but very clearly explained, and certainly useful to all Italian legal translators. All in all, another interesting day at the conference.